Holiday.gr - Elia, a trip to a myth! 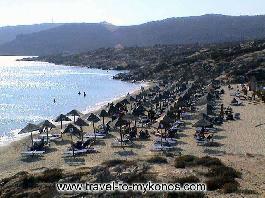 Elia is on of the most beautiful beaches in Mykonos. It is 8km from the center and rather cosmopolitan. The endless golden beach is her particular characteristic. Here you will come across to many of the celebrities that visit the island every year. Swim in the clear waters and enjoy all comforts provided by the good organization of the beach. If you feel like playing, visit the paradise of waterslides. Watermania is very close to the beach and covers a ground of 60sq.m. In the ultramodern facilities, you will have the time of your life. Been to Elia ? Share your experiences!